Imagine diving into your own resort style pool EVERY DAY!!! This incredible modern home in the desirable Eagle Glen Community is an entertainers dream!!! The entire backyard is set with pavers and includes a fire pit that seats 12 comfortably. A gas BBQ with ample counter space looks onto your own fruit trees including peach, plum, apricot and lemon. A covered dining space offers plenty of room to fit a 10 person dining table and is a great place to watch the game with surround speakers throughout the yar Imagine diving into your own resort style pool EVERY DAY!!! This incredible modern home in the desirable Eagle Glen Community is an entertainers dream!!! 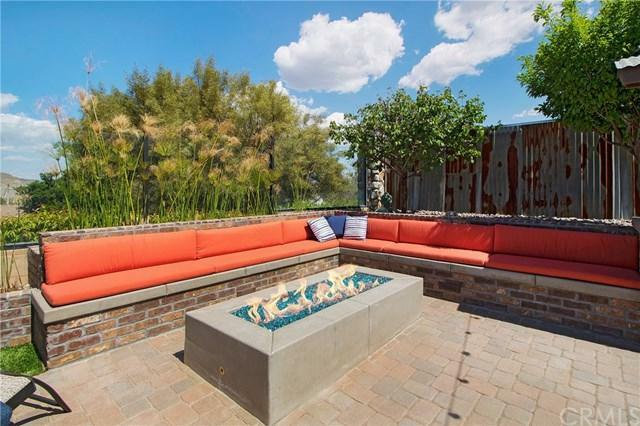 The entire backyard is set with pavers and includes a fire pit that seats 12 comfortably. A gas BBQ with ample counter space looks onto your own fruit trees including peach, plum, apricot and lemon. A covered dining space offers plenty of room to fit a 10 person dining table and is a great place to watch the game with surround speakers throughout the yard. As your party comes to an end, you and your guests will enjoy watching mountain views turn into city light views. The interior of the home quickly rivals that of the exterior with 5 spacious bedrooms, 4 full baths PLUS a downstairs office. Granite counters in the kitchen along with stainless steel appliances further enhance the modern appeal. A breakfast bar allows for seating and also provides a great room experience as one can enjoy the custom stone fireplace that anchors the large but cozy family room. The kitchen also provides easy access to the mud room AND 3 car garage with new roll up doors & epoxy floors. Upstairs has a large landing, tech desk, access to all bedrooms, including one EN SUITE. Double doors lead into master suite with enormous deck & huge walk in closet. Master bath features dual sinks, soaking tub and enlarged shower. No detail has been spared including smooth walls, custom paint, shutters, LED recessed lighting and ceiling fans throughout!